Farmers’ Helper™ UltraKibble™ 28 oz. Allergen Statement: This product may contain one or all of the following allergens: Peanuts, Tree Nuts, Soy, and Shellfish. 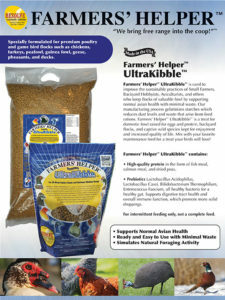 Farmers’ Helper™ UltraKibble™ 15 lb. 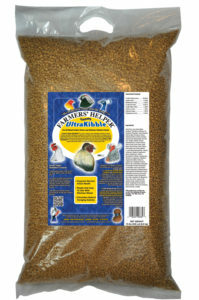 Farmers’ Helper™ UltraKibble™ is used to improve the sustainable practices of Small Farmers, Backyard Hobbyists, Aviculturists, and others who keep flocks of valuable fowl by supporting normal avian health with minimal waste. Our manufacturing process gelatinizes starches which reduces dust levels and waste that arise from feed rations. 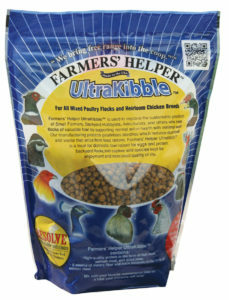 Farmers’ Helper™ UltraKibble™ is a treat for domestic fowl raised for eggs and protein, backyard flocks, and captive wild species kept for enjoyment and increased quality of life. Mix with your favorite maintenance feed for a treat your birds will love!